Prawns biriyani - A delicious and easy pungent rice recipe with prawns. The fascinating full-flavored prawn gravy layered with fragrant long non sticky basmati rice. 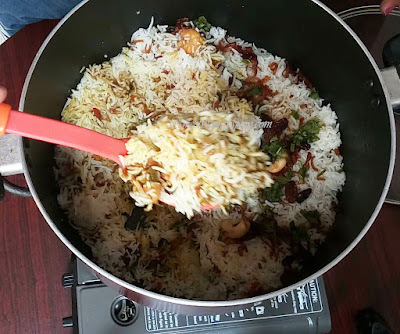 Even though, biriyani making is drudgery, but this one, you will enjoy having succulent rice more than prawns. 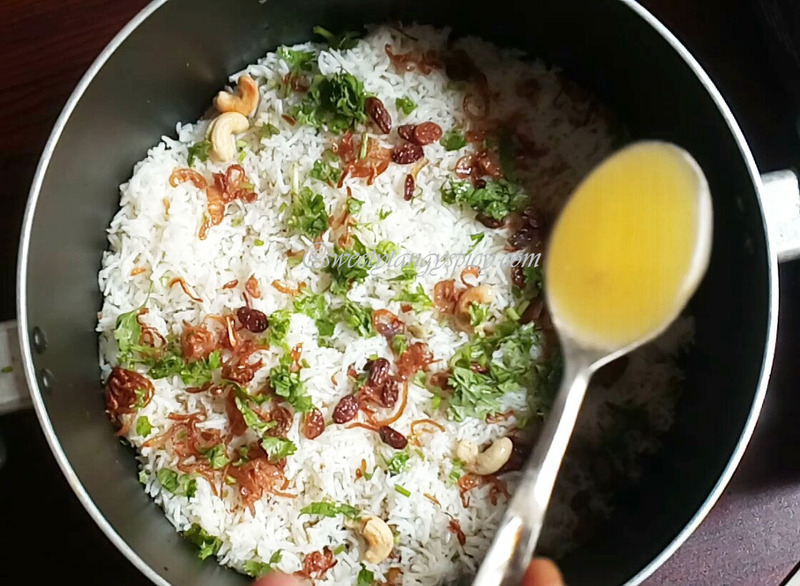 All the flavors will be very much infused into the rice and gives a lip-smacking dish. 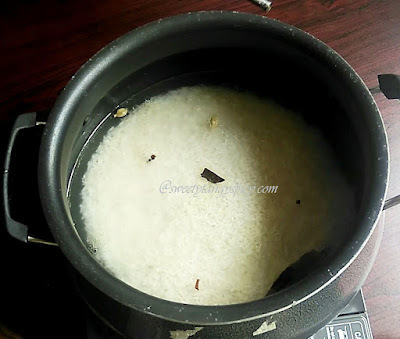 First of all, it is a typical Kerala cuisine, in which only the home made spices were used. 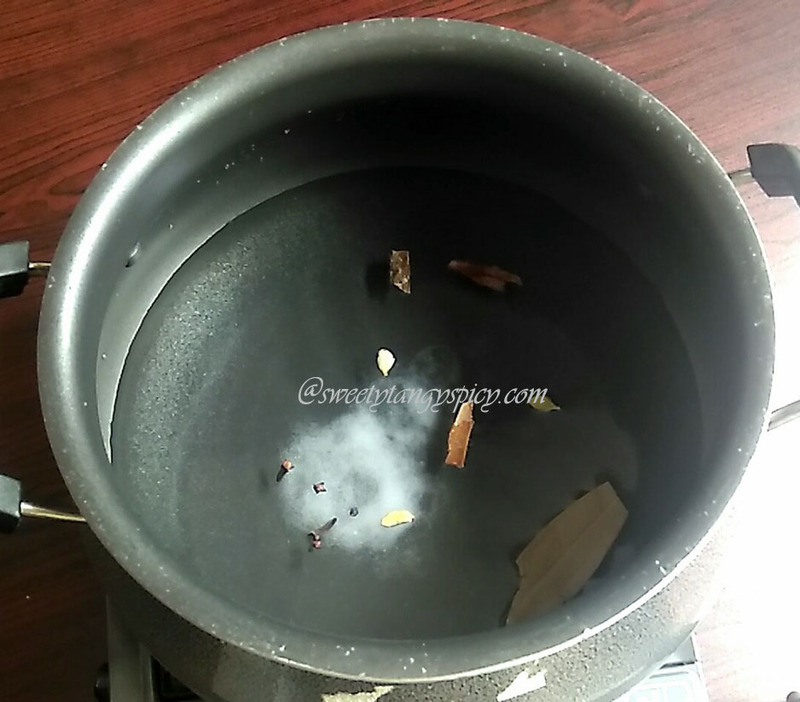 The garam masala which used here is Kerala garam masala. If you use the biriyani masala, the taste will also be altered. 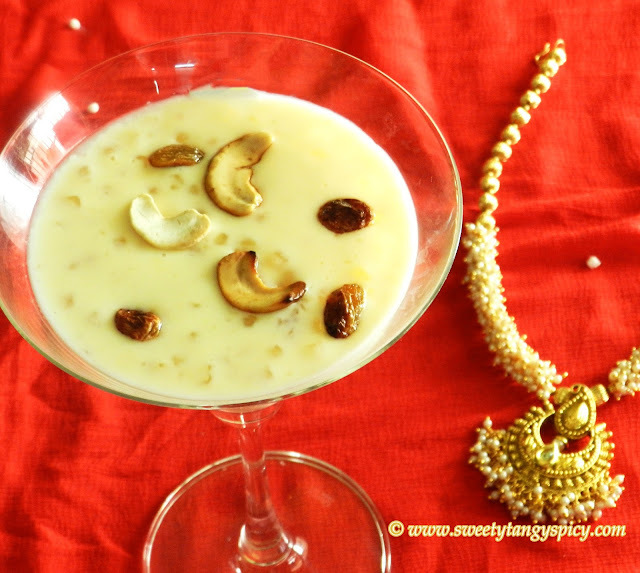 If you want to get the exact taste, then use the items described in the recipe. Frying onions, cashews etc: Use good varieties of ghee (like RKG) to get nice fragrance and taste. 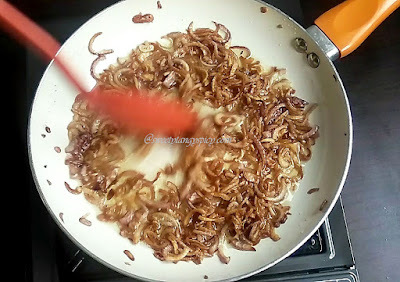 Please do fry onions in ghee only, as this fried ghee will be used while preparing rice and masala. Do not compromise this step, this is one of the major ingredients which provide nice aroma and taste to the biriyani. Cooking of rice: While cooking rice we will be using the same ghee in which the onions were fried along with the whole spices. This will help to get a nice caramelized onion smell in the cooked rice. 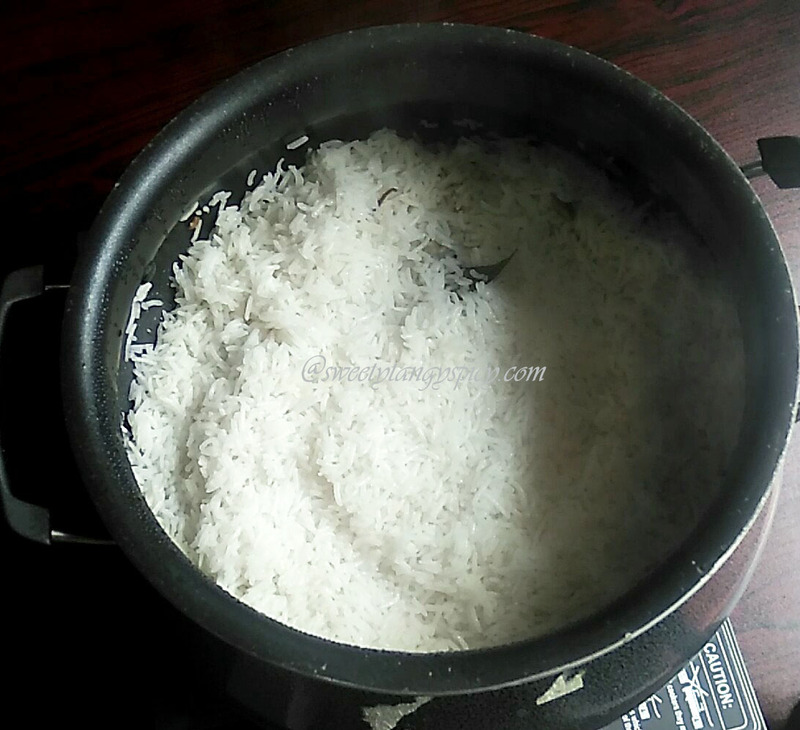 Also the rice should not be overcooked, it should leave a slight bit after cooking, i.e, it should only 3/4th cooked. Preparation of prawn masala: This the main part of biriyani. Before closing this step, please do not forget to adjust salt and spices. Also remember, the spices should balance not only the prawns but also the entire dish. So do adjust it before you go to the next level. You will not be able to adjust it once you mix or layer with the rice. Layering and dum cooking. 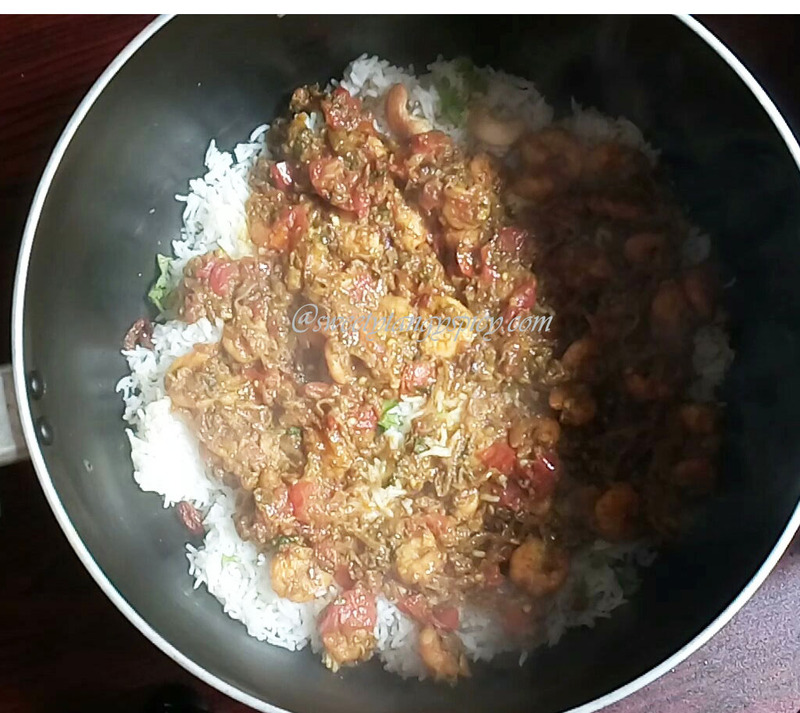 The flavored rice and prawn masala will be layered in a thick bottomed pot and then sealed tightly so that the steam should not escape and the food inside the pot should roast and mature in the steam trapped inside. 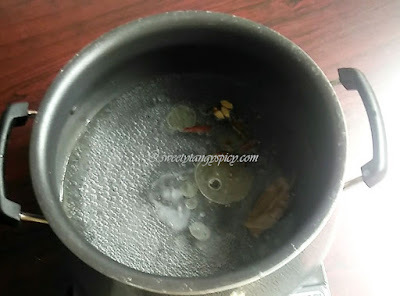 Finally the food will be flavored nicely with the aromatic steam produced by its own spices. 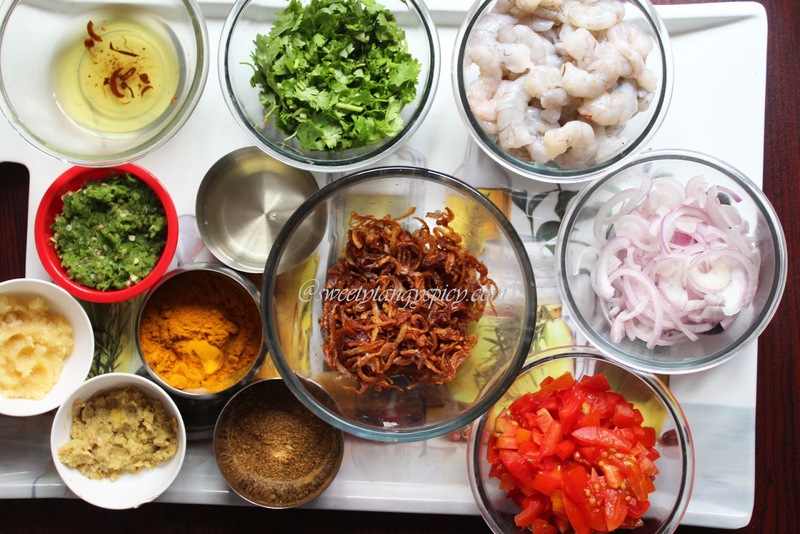 Keep all the ingredients ready. 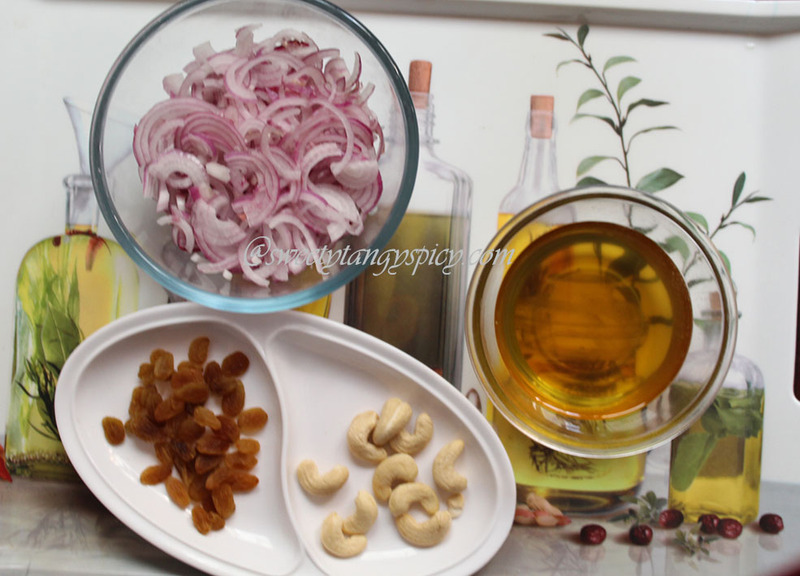 Thinly slice onions, take enough ghee, cashews and raisins. 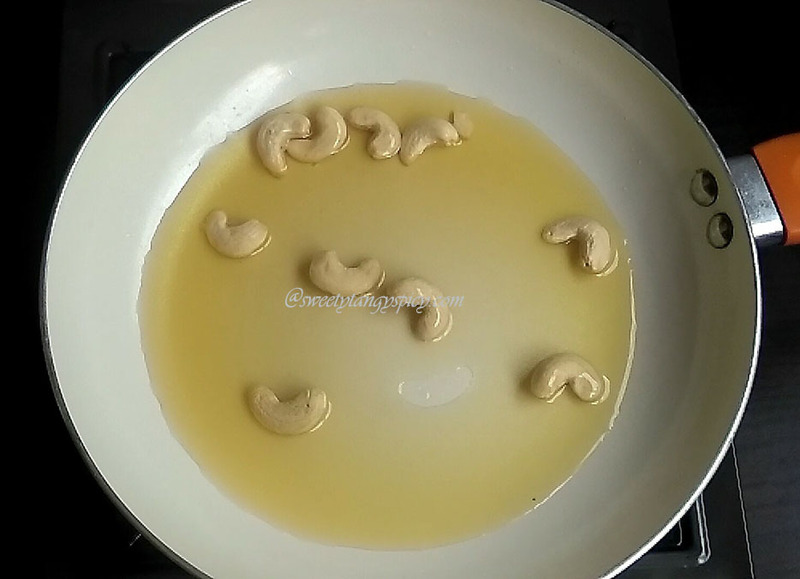 Heat 1/4 cup of ghee in a pan. 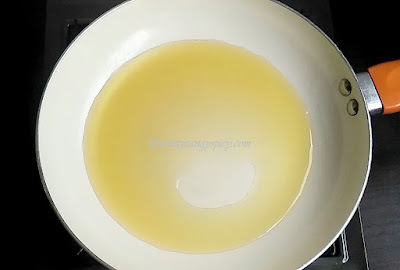 Once the ghee melts, reduce the flame to medium - low. Put 8 to 10 cashews. I have used whole cashews, if you don't have use the split ones. 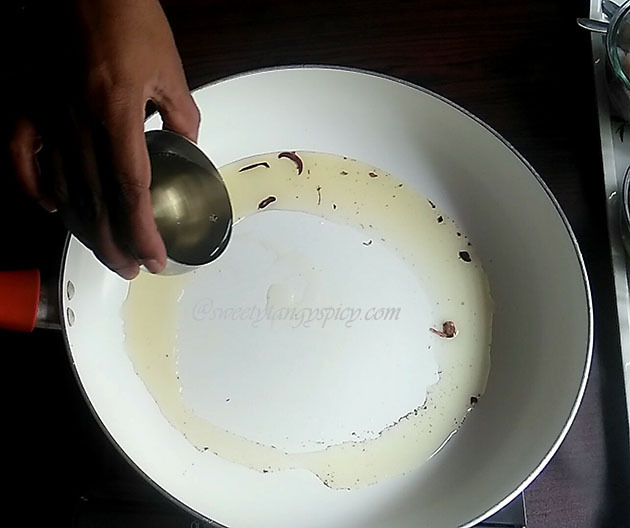 Stir it unless it turns to crisp and light brown in colour. Once ready, transfer immediately into a neat dry plate or bowl. Raisins will puff up within no time. Do not forget to stir in between. 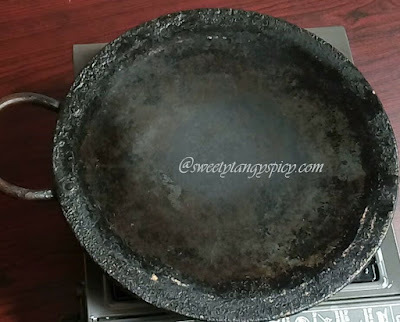 Once ready, transfer into a neat dry plate/bowl so that no further burning will occurs. To this same hot ghee pour remaining 1/4 cup of ghee and make it medium hot. 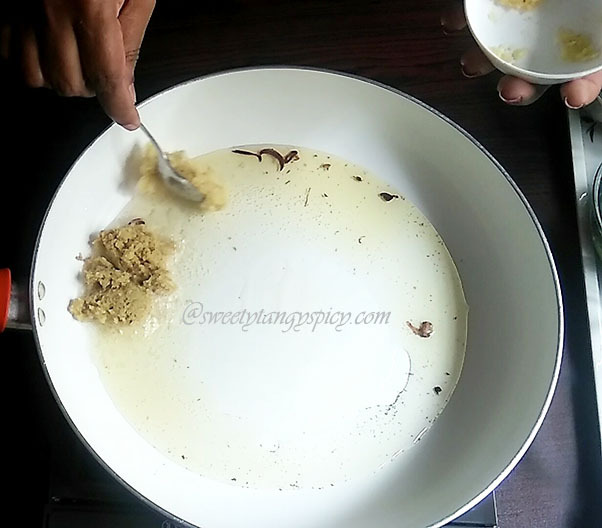 Once the ghee turns hot (but should not be smoking hot) put thinly sliced onions and a pinch of sugar. The onions take a lot of time to cook, but presence of sugar will fasten the caramelization. Cook till the onions turns dark brown in colour. 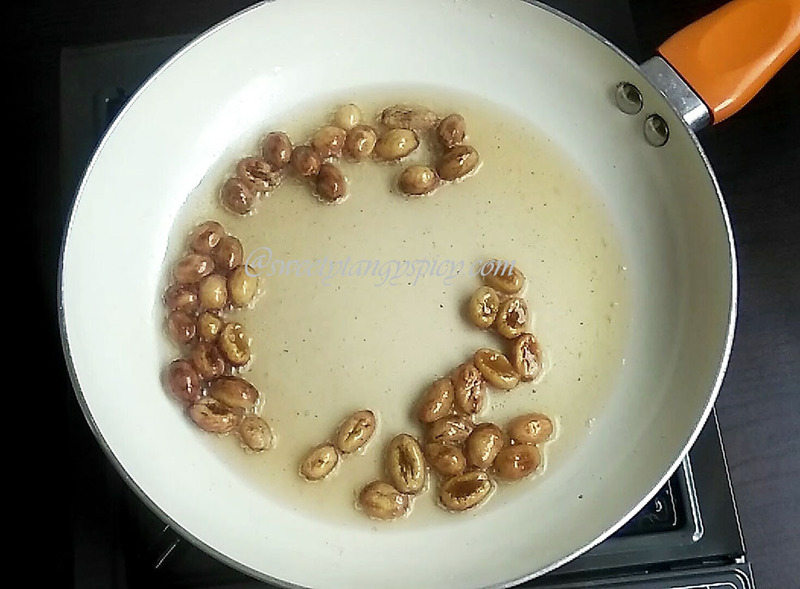 Remove from heat, just before, they browned completely, otherwise, it will burn due to the heat present inside. 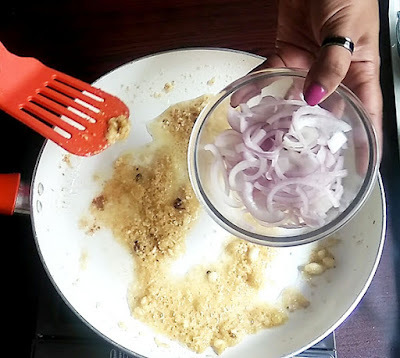 Slice onions thinly and uniformly. 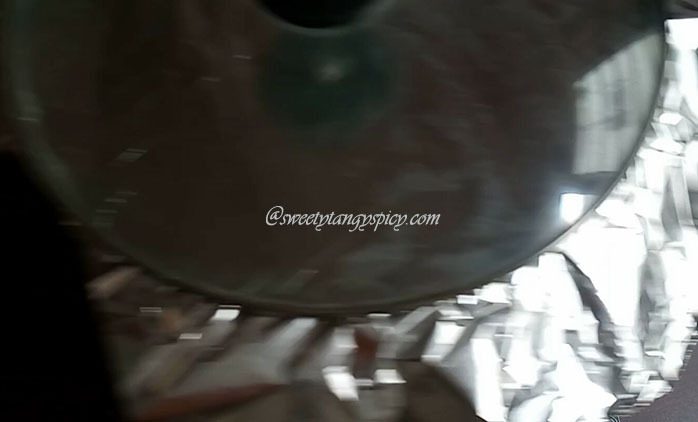 Remove from flame, just before completely done. 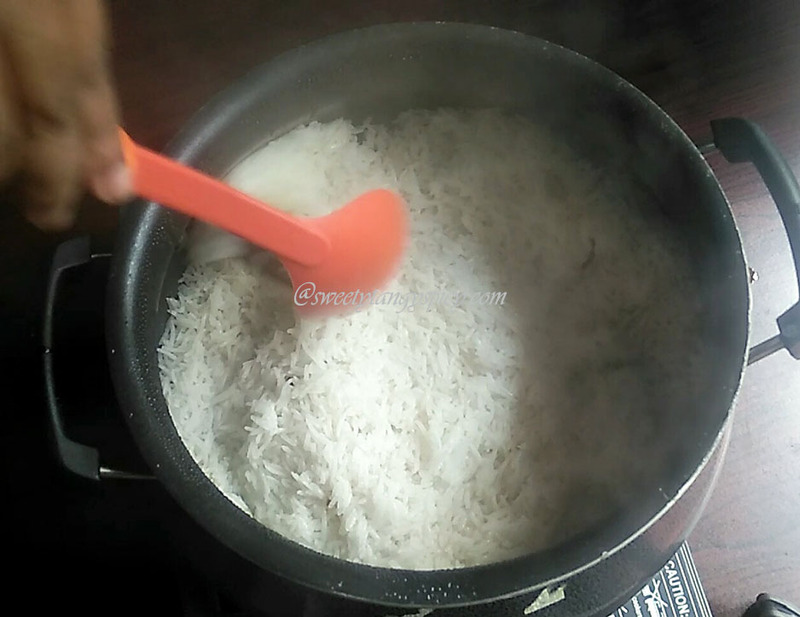 While preparing fried onions, rinse 2 cups of basmati rice / jeerakasala rice in running cold water till the water runs clear. Soak in enough water for 20 to 30 minutes. After the soaking time, drain excess water completely and keep aside. 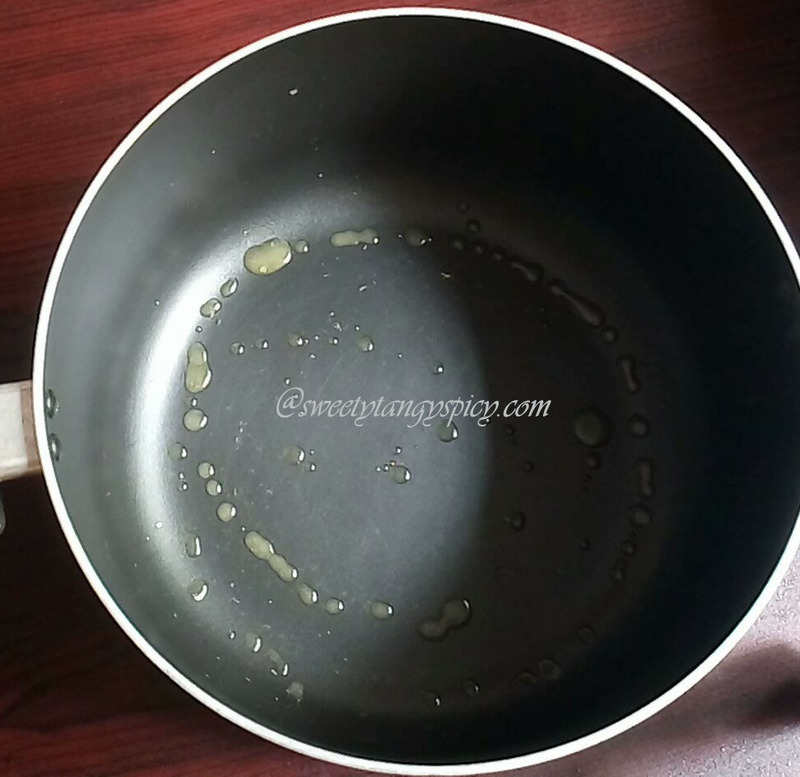 Take 3 1/2 cups of water in a deep pan. 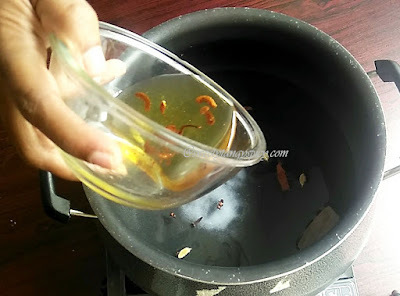 Put salt and the whole spices like 1 bay leaf, 3 cardamom, 2 to 3 small pieces of cinnamon and 4 to 5 cloves. 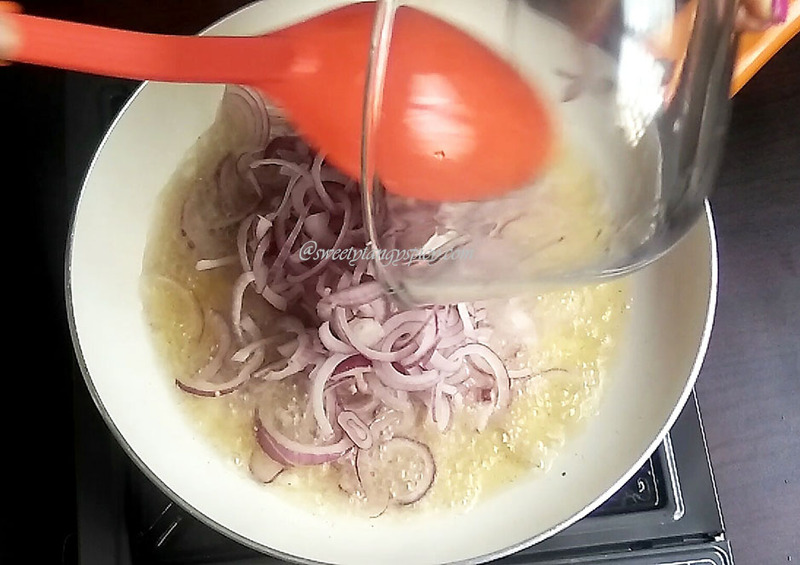 Add half of the ghee in which we fried onions, so that the flavors of onion infuse easily into the grains. Let it boil on high flame. Once boiled, reduce the flame to low - medium. 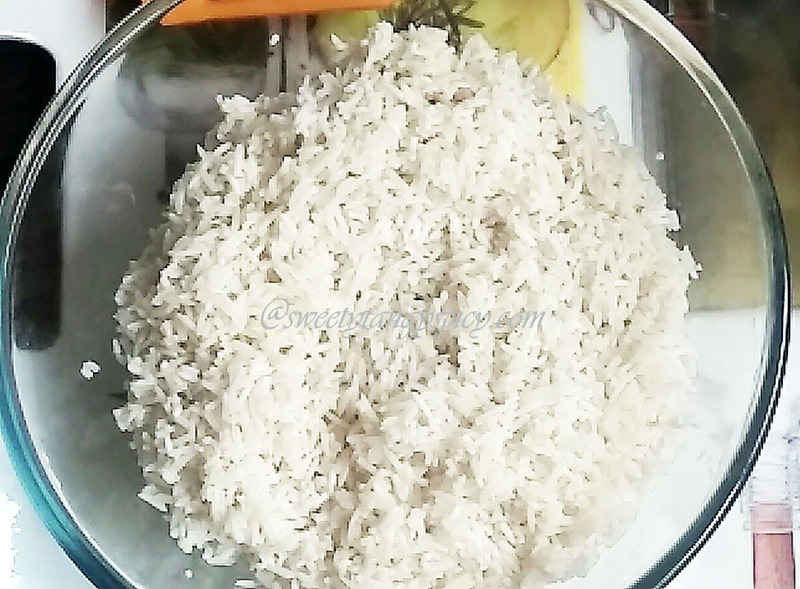 Then put soaked, drained rice and give a stir. 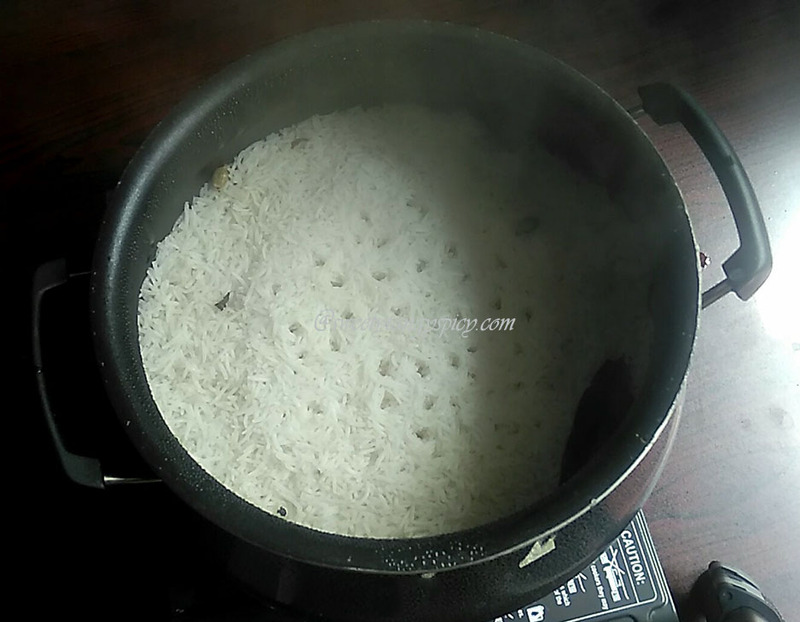 Cook covered, till all the water evaporates and the rice cooks, but 3/4 or 75 % only. 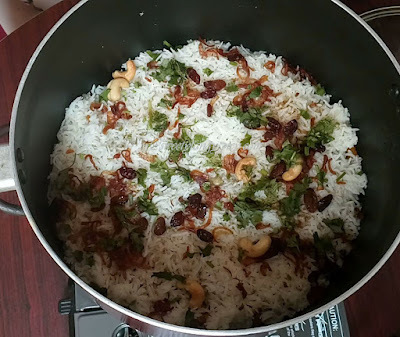 The rice should have a slight bit to them, i.e., the rice should be cooked but not completely. Once ready, gently stir with a fork or spoon and take care grains do not break. Always keep the rice hot until layering. It is advisable to prepare the gravy meanwhile the rice cooks. 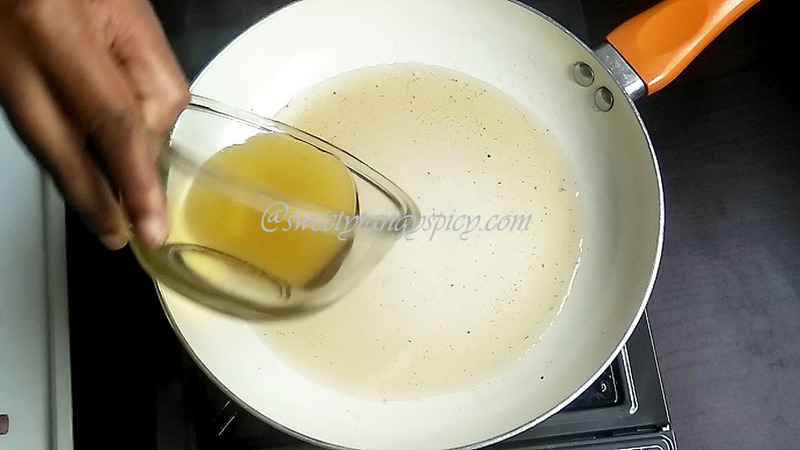 Before preparing the gravy, make sure that all your ingredients are ready. 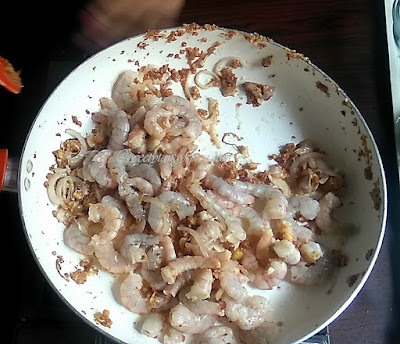 Wash, clean and devein prawns. Peel off the skin, then wash and slice onions thinly. Peel, wash and paste, ginger and garlic. If you want, you can crush or chop this too. Remove the stalk and grind green chilies. If you don't have enough ghee, you can put some coconut oil or sunflower oil to this. But ghee is advisable. 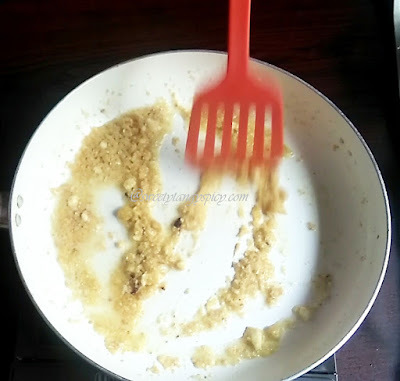 Once the ghee turns medium hot, Put ginger and garlic paste. 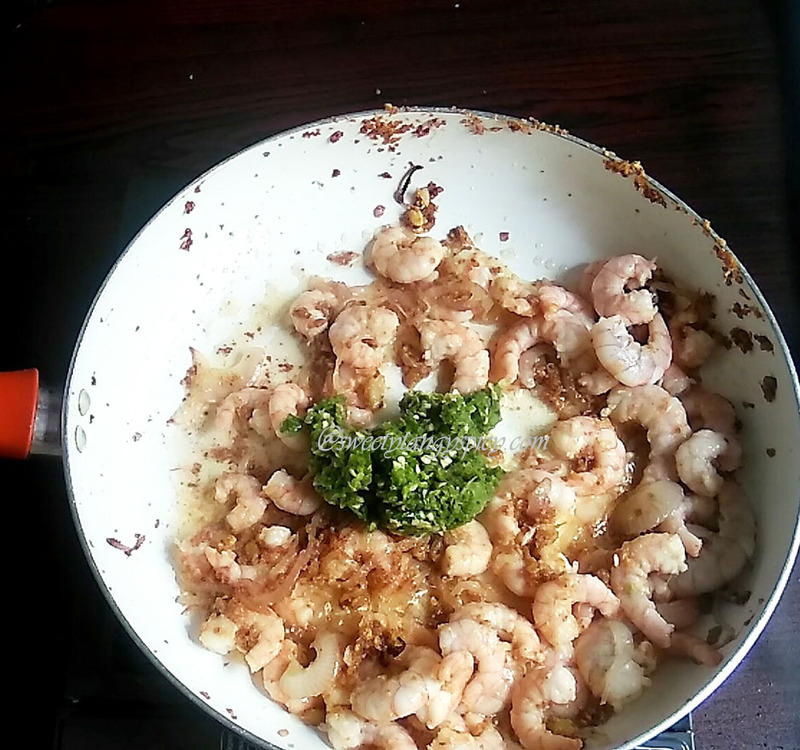 I have used approximately 1 1/2 tablespoon ginger paste and almost the same amount garlic paste. 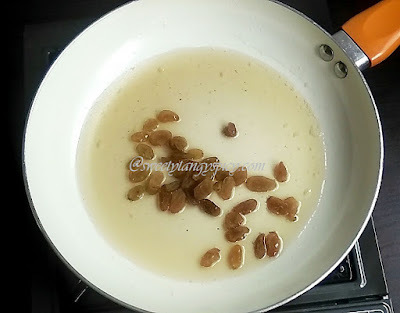 Stir and cook on low flame to medium flame. Make sure that the paste does not burn. 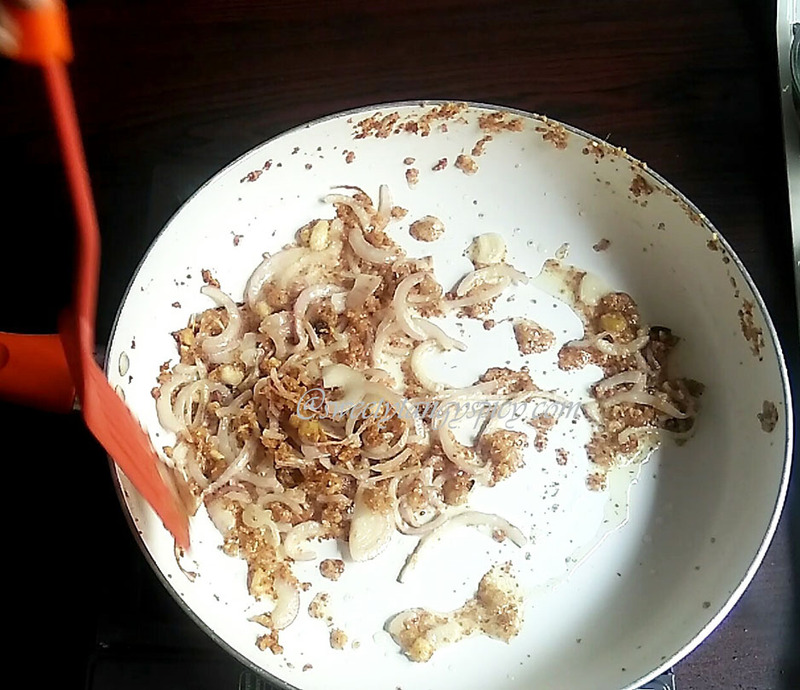 Once the ginger and garlic start to turn brown, you can put sliced onion. Stir and saute till the onion turns translucent. Next, add cleaned, deveined prawns and saute till partially done. 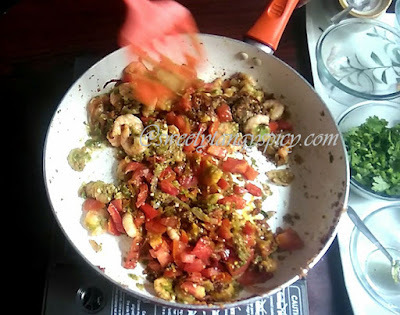 Its colour will change to red especially if you are using Kerala prawns. 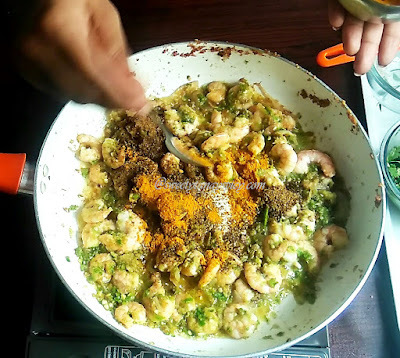 Then you can put the green chili paste. I have used 8 green chilies, this is the only source of spice, so adjust accordingly. Stir and saute for a few minutes till the chilies turn soft. 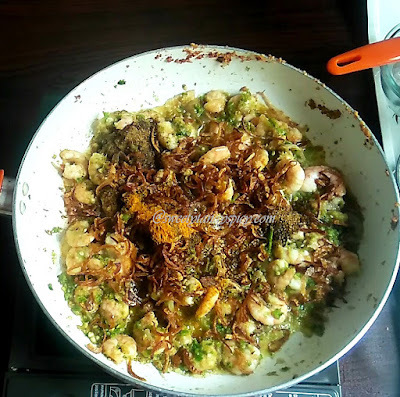 Now add 1/2 tsp turmeric powder and 3/4 tsp garam masala, (not biriyani masala, if you add biriyani masala to this, the taste will be different). This is the time to add fried onions, use 3/4 portion and save another 1/4 for garnish. Then you put chopped tomatoes and season with enough salt. 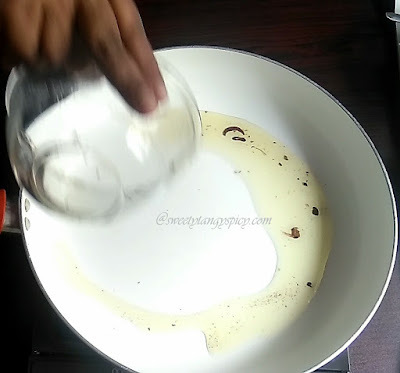 Mix till everything blend nicely. Put a handful of chopped coriander leaves and cook closed till the prawns cooked completely. Once the prawns turns soft and gravy thickens, switch off the flame. 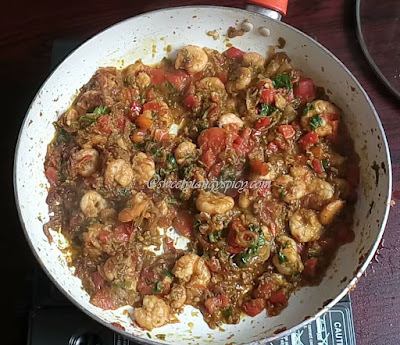 If the prawns are not cooked well, then cook for some more time. The gravy should have a semi thick consistency. If there is too much gravy, then simmer till some water dries up. Take a thick bottomed pan and spread one tablespoon of ghee on the bottom. 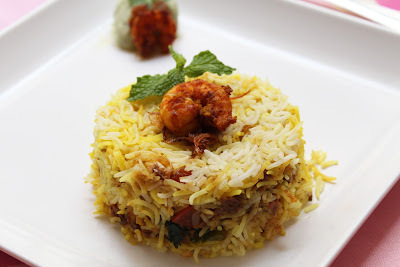 Make the first layer of prawns biriyani with half of the rice. 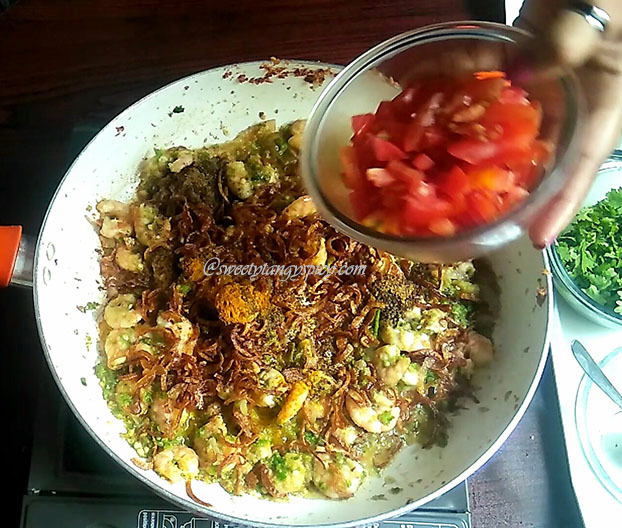 Sprinkle some fried onions, cashews, raisins and chopped coriander leaves. Spread the prepared prawns gravy on the top.The rice and prawn masala should be thick while layering. Make a third layer with remaining rice, sprinkle the remaining fried onion, cashews, raisins and chopped coriander leaves. Put 1 teaspoon of ghee. 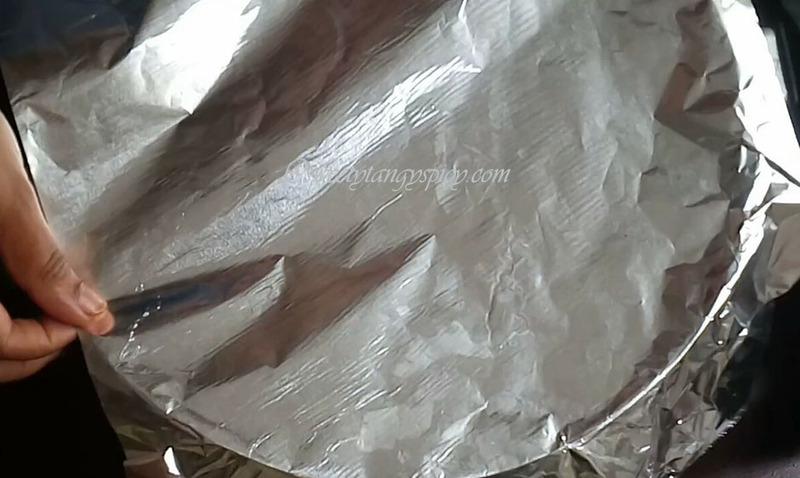 Then seal and secure the pot with an aluminium foil. Then cover with the lid. You can also use a moist cloth instead of aluminium foil. Heat a Dosa griddle or pan over high flame. 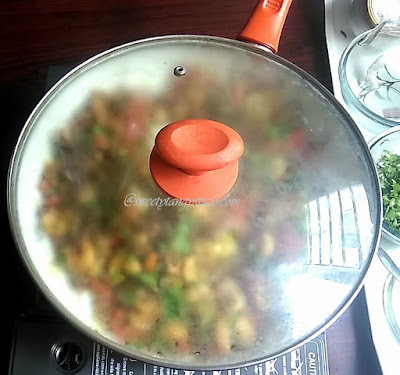 Once hot, put the biriyani pot over the griddle and reduce the flame to medium and cook for 20-30 minutes. After the dum period, give a 15 minutes rest, and then serve. You can serve prawn biriyani with salads, pickle and coconut mango chutney. Enjoy.